Well hello there fine people! It is Friday, and I am chilling out after the longest day of lectures in the history of education. The sun was shining/is setting but still lovely and bright and it is all dusky now! So, to the soundtrack of screaming children playing football apparently (though I have yet to see a ball appear), I am finally getting round to a food-related post, after a rather pathetic food-related-posts week, for which I apologise. Well here is the story: Inspired by the sun, a lack of money, and my inability to wear lovely pretty clothes that I have stashed away, I have made my three hundred and eighty seventh attempt to cut out the crap and be healthy. So I’ve started classes at the gym, as I tend to get a bit bored with my normal workout. I started spinning, which wasn’t as bad as I thought it would be, and I intend to go to rebounding next week! And possibly to a mixed workout class where they do about 15 mins of 3 different workouts.. Boredom beater yay. I am also eating somewhat better. Or getting there at least. 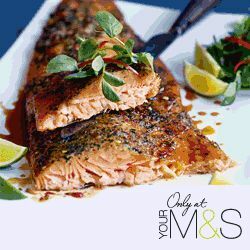 And thanks to a post I read a few weeks ago over at Lola-Lu’s kitchen (Hi guys!) I discovered fruitfellas.ie. 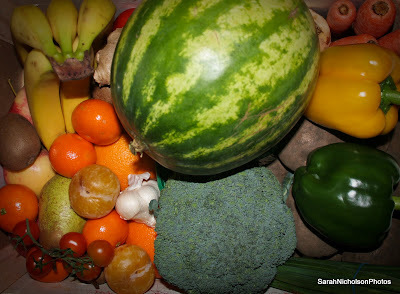 They get lots of lovely fruit and vegetemetables and deliver em to your door. And given my lack of car/bike/wheeled/aeronautical transport of any kind, I find it extremely awkward and painful to lug lots of heavy fruit and veg around. And I love the stuff! 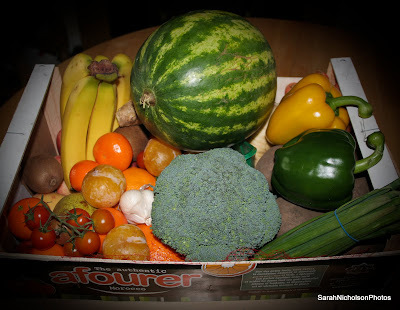 So I emailed the guys and asked a few questions and Hey, presto, they arrived on my doorstep with a brand spanking new box of fruit and vegetables, all for me, all for the grand old price of 20 yoyos. Phew. Now I haaad to test the fruit so judging on the bananas and yellow plums- so far so good. Lovely, not too ripe. Pears still need a little ripening, but that suits me, can’t eat all the fruit right now. Well.. I probably could actually.. So my plan for the future, depending on how this works out, is to use these guys as my fruit/vegmongers, and just get meat and fish and any grains/pulses/that kind of stuff when I need to in the butchers/supermarket/recently discovered Asian market! This suits me cos the less time I spend in supermarkets, the less time I spend impulse buying. And trying (unsuccessfully) to walk by the freshly baked chocolate yumminess inside the doors in the supermarket. Especially since I’m usually famished going shopping.. I know, I know it’s a big nono, but when you’re stuck for time you go when you can! And when I can it’s generally when I’ve run out of food and am thus mightily hungry. Costwise – Well I thought it looked pretty good at first glance either way, what with delivery and all, so I took it upon myself to check the online shopping price for the same list of items and it worked out at around 27-30 on the 2 I checked. So very good to be getting the lot & delivery for 20euro! Plans for this lot of loveliness: Apart from gobbling it all down, I was thinking perhaps Irish stew might be nice for some of the veg (carrots, parsnips, potato), but it’ll be the end of next week before I do it, as I believe the parents are dropping into me with local home food that just tastes yummy and includes about 2lb of round steak mince, so gotta use that up! I was debating some sort of Cannelloni Bolognaise (use for garlic, mushrooms & peppers) type shenanigans (alternatively see Dips). Seeing as I have lotsa tomatoes. Bought ’em when Richie drove me back, I believe I have about 12 tins. Give me 2 weeks, they’ll be gone. Tomatoes, Garlic, Onions – Staple foodstuffs of my kitchen. Along with rice and pasta, the hungry students friend! Well, sin e as they say. For now anyhow. I am rhyming. The fruit and veg look lovely. Never heard of fruitfellas, I must look them up. It doesn’t feel like a lot of veg though. It doesn’t look like there’s too much in some of the pics but there’s plenty trust me. Well you can’t see the giant potatoes in those pics admittedly.. Like carrots, parsnip, brocolli, scallions, a good few mushrooms, peppers, ginger (2 x types tomatoes, fruity veggy uncategorisedness). It’s a pretty good haul. Oooh have lettuce in fridge, may make yummy salad + balsamic vinegar. Currently devouring another yellow plum and banana after my hour of exercise! 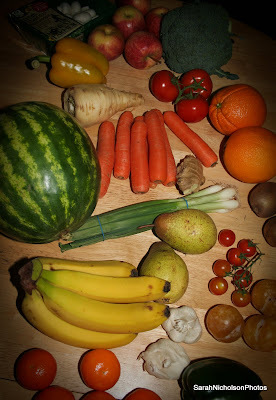 If you are near an Aldi I would really recommend going there for fruit and veg on a budget. This week they have plums, asparagus, a pineapple, leeks, grapes and cherry vine tomatoes for 5 euro. I go there on a Monday and that does my veg for the week (plus mushrooms for 99c and probably a couple of carrots for about a euro). It really is brilliant value. Thanks so much for taking the time to write about us! Great piece. Look forward to seeing you next week. There will be some free strawberries in the box for you!